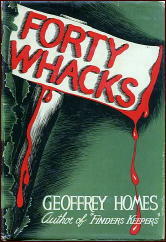 » Reviewed by William F. Deeck: GEOFFREY HOMES – Forty Whacks. Reviewed by William F. Deeck: GEOFFREY HOMES – Forty Whacks. GEOFFREY HOMES – Forty Whacks. William Morrow & Co., hardcover, 1941. 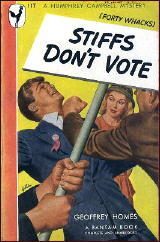 Reprinted in paperback as Stiffs Don’t Vote, Bantam #117, 1947. Film: Warner Brothers, 1944, as Crime by Night. Private detectives Humphrey Campbell, milk drinker and accordion player, and his boss, Oscar Morgan, who likes much stronger stuff, have left Los Angeles under some pressure and have relocated in Joaquin, California, to the distress of some people. With the exception of threats from the city’s district attorney, business starts out well, with a request to locate Joseph Borden, pianist. Campbell, the leg man and the brain man of the agency, at least in this novel, finds Borden, who is minus one hand, which hand was chopped off by his mother-in-law, Mrs. Gertrude Peck, the publisher of the city’s only newspaper. When the mother-in-law is found, first by Borden, considerably chopped up, the police believe Borden did it in revenge. There were, however, many other people who had no love for Mrs. Peck. In the midst of a political campaign, she had endorsed first one candidate for mayor and then another, both of them corrupt. One of the rewrite men on the newspaper said that all the employees were suspects. Her lodge, where she was killed, was as busy as an airline terminal what with people who feared or loathed her visiting just prior to her murder. Campbell solves the case, to my complete dissatisfaction. Not one of the better investigations of Morgan and Campbell, who can be compared to Frank Gruber’s Johnny Fletcher and Sam Cragg but are not nearly as amusing. After seeing the film OUT OF THE PAST and enjoying the Geoffrey Homes novel it was based on, I got all the Homes I could find,hoping for something similarly memorable. “Forty Whacks” is a Homes novel I haven’t read yet. Here in the frozen Midwest, a mystery set in Sunny California sounds great. It is 12 below outside! In recent years have been catching up with the Homes books. Most entertaining so far: “Then There Were Three” (1938). It features Homes two main series detectives. It is the last of the Robin Bishop novels. It is also the first Humphrey Campbell book, introducing that private eye series sleuth. The two men work together to solve the mystery. Your comment reminded me that there’s a movie based on this book: Warner Bros., 1944, as Crime by Night, and I’ve added it to the info at the top of the review. CRIME BY NIGHT is a great little film with a fine cast that includes Jerome Cowan in the Campbell role, Jane Wyman his assistant, and early roles for Jane Greer and Eleanor Parker. Cy Enfield is good as a sheriff looking to get re-elected. I liked this book much more than Bill, and have long admired Mainwaring/Homes as mystery writer and screenwriter. At least one other book aside from OUT OF THE PAST, NO HANDS ON THE CLOCK, was filmed with Chester Morris.